from 3 pcs. 3,39 EUR ea. The narrow white metal strip is an ideal surface for small magnets. It is perfectly suitable to secure postcards, event notices, pictures, business cards, kids drawings, posters, etc. with magnets. The backside of the strip contains a self-adhesive foam. Just remove the foil, press and done. You can also line several strips up in a row. The foam adheres strongly to different surfaces and is not removable without residue. Important: The adhesive only develops its full strength upon full contact with the underground surface. The smoother, the better the effect. Avoid uneven or rough surface. You can find all the tips for our self-adhesive products in our FAQ. Please note: The strip itself is not magnetic, but it provides a metal base that magnets adhere to. 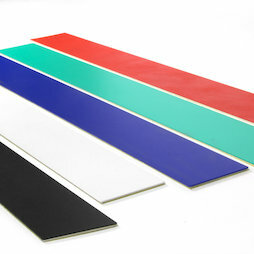 If you are looking for coloured magnetic tape, select the article Coloured magnetic tape 40 mm. If you need self-adhesive magnetic tape, Magnetic adhesive tape ferrite 40 mm is the right choice. The magnetic strip can also be used to hang up jewelry and other light items. In the picture we used small white magnetic hooks that keep a low profile on the white strip. Heavy objects would not work, however, because the metal in the strip is very thin.